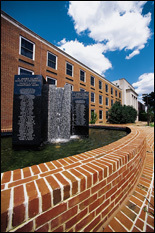 This fountain on the plaza in front of Martin Hall lists the names of former commitment award honorees. The ceremony recognizes individuals in the college whose extraordinary contributions have made the Clark School a better place to live and work. The names of the honorees are carved into the fountain that graces the Martin Hall plaza.